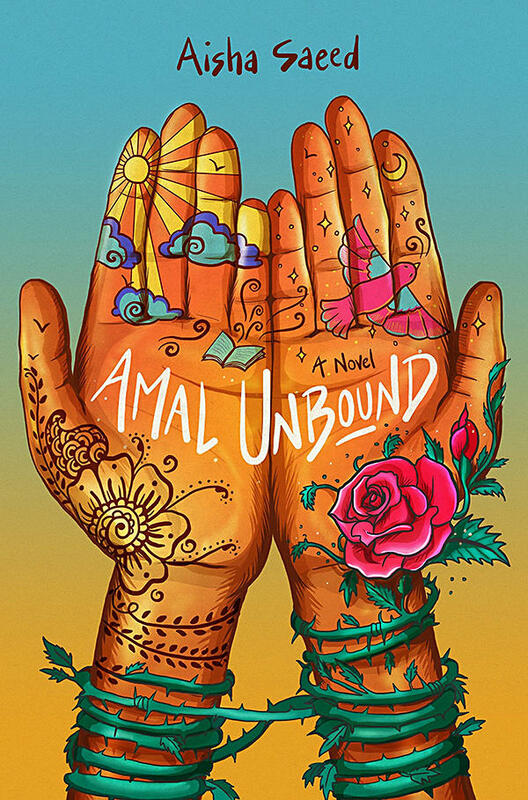 Amal Unbound written by Aisha Saeed and set in a small village in Pakistan is a captivating novel about one girl’s determination to be free, get an education and become a teacher. Twelve-year-old Amal loves school. When she must stay home to help her mother who is recovering from childbirth her teacher arranges for her to continue her lessons at home. One day at the market, however, Amal is threatened by a man who knocks her down with his car and then demands that she sell him the pomegranate she has just purchased. She is unaware that he is the ill-tempered son of the corrupt ruler who has taken over the village. She stands up against his demands causing a scene in the marketplace. Several days later, the bully comes to collect on a loan that he gave to Amal’s father. Her father does not have the money. Consequently, Amal is taken as a servant to his estate to live and work until the loan is paid back. There she meets other girls in the same cruel situation. She also discovers there is no way to ever pay any loans back since the girls are charged each day for living there! Amal keeps her eyes open and looks for an opportunity to bring an end to the corruption and the practice of indentured servitude. Amal tells her story in the first person. The narrative is very genuine and full of emotion. Her guiding philosophy is, “If everyone decided nothing could change, nothing ever would.” Courageous Amal makes a difference. Amal Unbound is beautifully-written by Aisha Saeed and will engage middle-grade readers 10-13 years of age (Nancy Paulsen Books/ Penguin Young Reader’s Group). Author Aisha Saeed attributes her writing of this book to the courageous actions of Malala Yousafzai and all the brave girls who speak up for their right to an education and for justice. Find the transcript of Malala’s 2014 Nobel Peace Prize Acceptance Speech on the internet. Read it. How does it make you feel and why? Discuss it with your parents, grandparents and teachers. In the Author’s Note Aisha Saeed says, “The issue of indentured servitude covered in this book is a global problem affecting millions of people, including in the United States.” Have you heard of this problem before? If not, you could ask your teacher to discuss it at some point.